These coffees maintain their lush flavors, aromatics, and nuance in their ground form due to a few simple tricks: high-quality coffee, precision grinding, and individual sealing. Expect rounded acidity and the same sweetness you’d expect in our whole bean coffees. Try with 6oz to 8oz of filtered water depending on your brew strength preference. 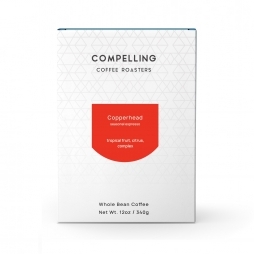 We chose two of our most flavor-rich offerings from this last harvest to blend into versions of our Copperhead and Brown Betty profiles that maintain nuance and balanced acidity long after roasting. Each dose was precision-ground on a Mahlkonig grinder and individually sealed. Expect flavors of brown sugar and round tropical fruit notes in our Copperhead line, and milk chocolate and jammy fruit in Brown Betty.